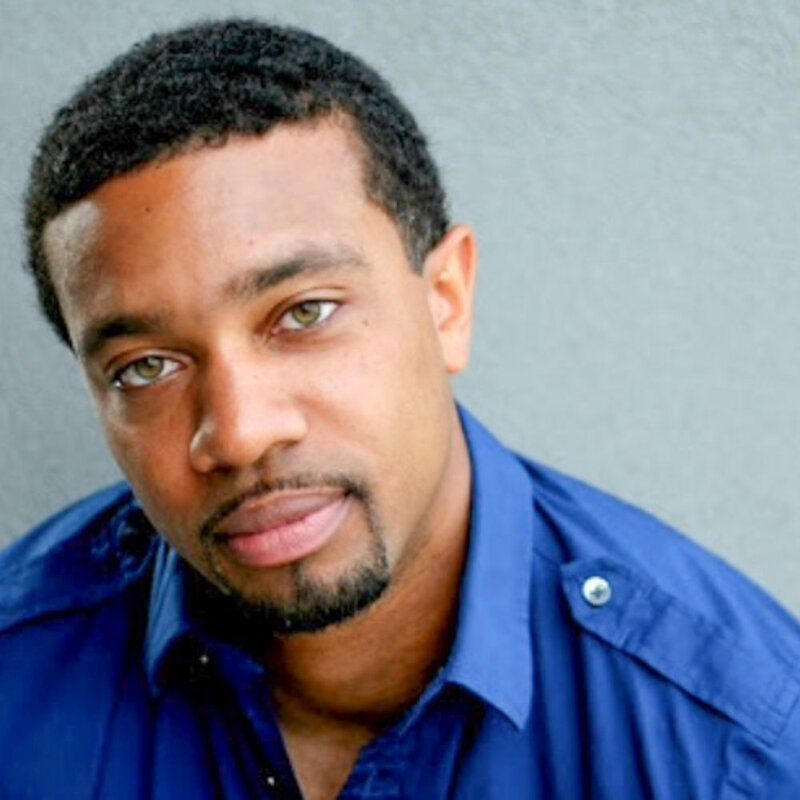 Headlining is the incomparable family-friendly comedian and motivational speaker Mack Dryden. A Louisville native,and former staff writer for Politically Incorrect with Bill Maher, Dryden has performed on The Tonight Show, JAG and The Guardian. A 2010 winner of the Louisville Improv Comedy Derby contest and the Kent Carney award for Comedian of the Year in 2014. He was named funniest black comedian in Louisville in 2012. You can find Sean’s comedic stylings at the Podcast "BOUT TIME" that he hosts with Patrick Passifume on i-tunes and bouttime.libsyn.com. A former radio personality and FOX in the Morning movie critic, has appeared on The Sundance Channel and numerous comedy stages in the Midwest, and is the co-creator and co-host of the interactive game show, "The Same Game." We have a winner! Yesterday a name was selected during a blind drawing, and the winner accepted the sponsorship. Congratulations, Tom and Amy Kaikis ! We look forward to seeing them at Lakeside Swim Club this summer. Thank you to each of our donors. You gave Hal Warheim Park an incredible gift. 100% of the profits from this raffle go toward the maintenance and beatification of the park. Hal Warheim Park is solely supported and maintained by donors and volunteers. We invite you to check our Facebook page for updates and opportunities to volunteer. Thanks to everyone who purchased raffle tickets for Lakeside Swim Club! Because we sold all 75 tickets in less than a week, we'll do the raffle drawing TOMORROW MORNING, January 30, at 11 am. The winner will be selected from a blind drawing and will be notified immediately by email and phone. Hal Warheim Park has been generously donated a Lakeside Swim Club sponsorship to begin with the upcoming summer 2019 season. This sponsorship is for an individual or family membership. Raffle tickets may be purchased until 11:59 p.m. on February 20th. Only 75 tickets will be sold. The winner will be selected from a blind drawing on February 21st and will be notified that evening by email and phone. The winner will have 24 hours to respond to our notification. If there is no response within 24 hours, another winner will be selected. 100% of the profits generated by your donation will go directly toward the maintenance and beautification of Hal Warheim Park. The winner of the raffle will be responsible for the Lakeside Swim Club initiation fee and the annual dues. The winner will be contacted by the Lakeside Swim Club sponsor and a new member orientation meeting will be set for a date in March-April. The initiation fee and membership dues are to paid to Lakeside Swim Club during this meeting. The membership is continuous as long as the membership is paid each year and the members are in good standing with Lakeside Swim Club. We’ve been busy this month with regular— and unexpected—maintenance. 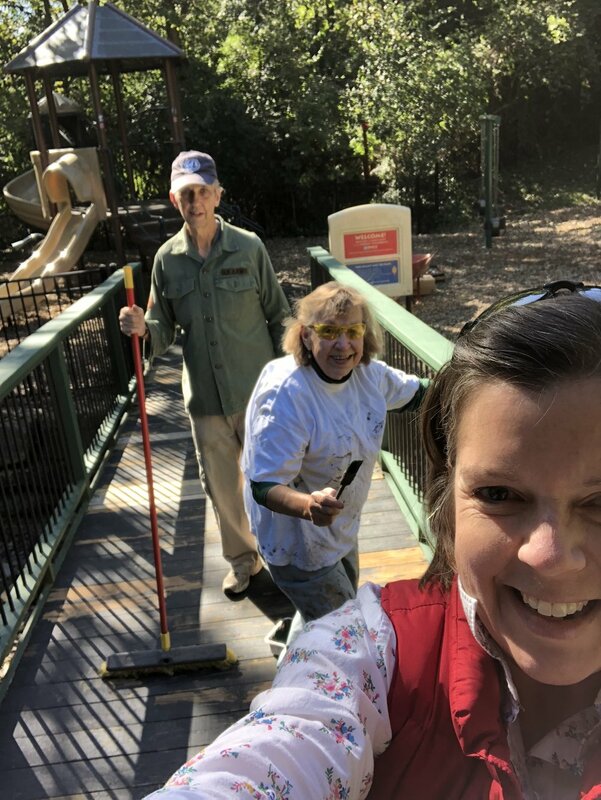 It was time to repaint the bridge, which may sound like drudgery until you actually sit on the bridge in the full splendor of a warm, sunny, fall day in the beautiful Hal Warheim Park. We enjoyed our time scraping and painting, listening to others enjoy the park and getting to know those visitors. A little more unexpected—the wind blew the kiosk over last Saturday. Our maintenance committee worked quickly to replace the kiosk posts. Also, a tree behind the bridge is leaning into our neighbor’s yard and we are getting bids to remove it. Some of you may not know that Hal Warheim Park is a community park, solely supported and maintained by donors and volunteers. We work hard to keep the park safe, clean and beautiful. Join us for volunteer days, or volunteer on one of the committees or through our board. If you can and want to join our volunteer team, please contact us at warheimpark@yahoo.com. The work is always more fun with a group of great people! We are prepared and excited for Haltoberfest this Sunday afternoon. We hope many friends and neighbors can make it for free food (hot dogs, chips & cookies) and drink (lemonade & water) and music by Brigid Kaelin. You can make a difference! Volunteers are essential to helping keep Hal Warheim Park beautiful. Whether one hour or all three, individuals and groups can join the effort to beautify the park. We provide the gloves, tools, refreshments and guidance; you just need to dress for the weather and getting dirty! Our next work day is Saturday, October 20 starting at 8:30 am. A typical park visitor enjoying the slide. After a few incidents involving vandalism in the park in early spring, Warheim Park Board of Directors worked quickly to address the reported situations. As you may remember, we met with Lt. Alejandro Cabrera and he promised to familiarize LMPD in the 5th Division with the park. At the August board meeting, we decided to start a Park Patrol schedule for the remaining warm months. Board members now visit the park on a regular basis (in hour shifts) in hopes of deterring any unwanted behavior. We then share results with other board members and report any suspicious behavior to the LMPD (none noted so far). What are we seeing? Lots of sweet families with young children, people walking their dogs, high school cross country runners coming in for a drink, teens enjoying Subway in the pavilion. Hal would love this! He so loved seeing people enjoy this park. We are also noticing how beautiful the park is. There are reports of butterflies and hummingbirds (as well as a mosquito or two biting at our ankles). Some patrol and pull weeds. Others patrol and enjoy the meditation garden. Others patrol and get to know the park patrons. It's been a delight for all involved. If you would like to be a Park Patrol volunteer, let us know! You can email us at warheimpark@yahoo.com. If you see any suspicious activity, call Louisville Metro Police Department 5th District at 502-574-4111 ext. 5. All calls are recorded and responded to accordingly. We appreciate your help in keeping Hal Warheim Park a safe, friendly and beloved place for all of us to enjoy. Our Commitment to Helping Keep Hal Warheim Park Safe. Most of the time, everyone follows the rules. However, there were a few incidents in the park, such as the vandalism pictured here, over the winter. One involved an adolescent who was seen unconscious, with signs of vomiting, surrounded by a group of peers who were not taking action to help. Suspecting something amiss, a concerned park patron who had come upon the scene called 911. Warheim Park Board of Directors worked quickly to address the reported situation. We met with Lt. Alejandro Cabrera in March and he promised to familiarize LMPD in the 5th Division with the park. He also recommended everyone in the neighborhood and those living adjacent to the park be vigilant, and not hesitate to call if anything appears suspicious. We were all a little sad to let go of "Fireside Friday," our annual fundraiser at Hal Warheim's house, because we all loved the ease, simplicity and intimacy of the event. Everyone loved being in Hal's home sharing food and wine, catching up with neighbors. An added bonus was the money raised. This year we had to brainstorm new fundraising ideas for the park. We decided on a comedy night and a Lakeside Swim Club membership raffle and are excited to say that we "knocked it out of the park" with both events. 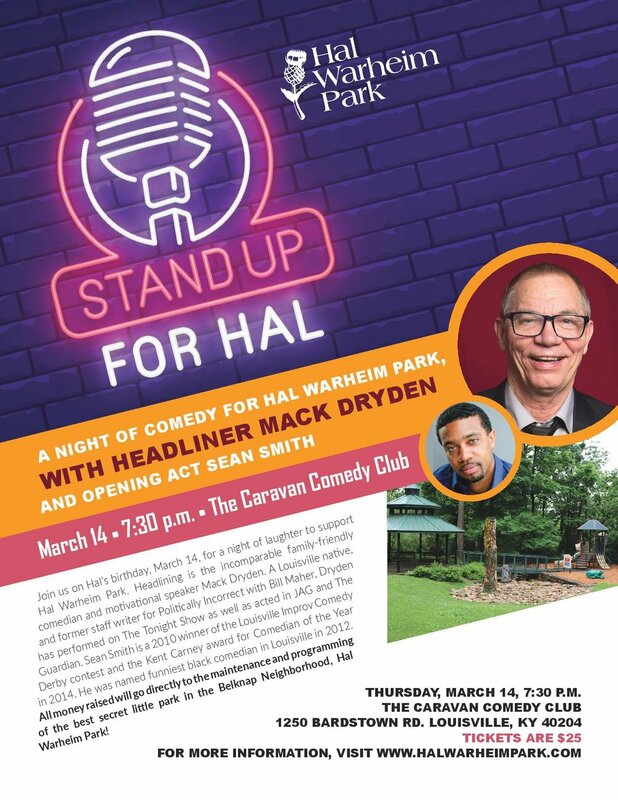 We raised over $1500 at Stand Up for Hal: A Night of Comedy for Hal Warheim Park on February 11. A special thank you to the Bard's Town for hosting and to comedian (and neighbor) Mack Dryden for providing the comedy. We hope to organize another comedy night next year, perhaps at a bigger venue. We also raised over $7000 with the Lakeside Swim Club membership raffle. We sold 75 tickets at $100 each and our winner was selected and notified Sunday night. We know what an amazing experience it is to be part of the Lakeside Swim Club community and we look forward to hosting another sponsorship raffle next year. The Warheim Park Association thanks you for your support in both events. All money raised goes towards maintenance and beautification of the park. What's coming up next? Join us on Saturday, March 24 for a Volunteer Work Day at the park. See details on the event page. For many years, usually in February, we've held “Fireside Friday” at Hal Warheim's house. The premise was simple—have fun and raise money for the park. It was a lovely event, in Hal’s cozy and very interesting home, filled with eclectic décor, souvenirs and hats from his travels all over the world. Friends and neighbors would catch up over appetizers and drinks around Hal’s fireplace. We are honoring this big story, having some fun and raising money for Hal Warheim Park on the evening of Feb. 11 at the Bard's Town. Money raised will go towards maintenance and programming in the park. While Louisville Metro Parks Department holds the title to Hal Warheim Park, responsibility for the supervision and maintenance of the park rests solely with the Warheim Park Association and funding comes entirely from donations and fundraising. Family friendly comedian and motivational speaker Mack Dryden, a Louisville native (Dryden happens to live in the Belknap Neighborhood), is a former staff writer for Politically Incorrect with Bill Maher, and has performed on The Tonight Show with Johnny Carson, as well as acted in JAG and The Guardian. There will also be an opening act, hopefully Sean Smith, a nephew of Dawn Gee. Support us with your laughter on February 11. Learn more and purchase tickets at https://goo.gl/xbe6YH. On October 22nd we celebrated the life of an extraordinary man: Hal Warheim. Hal had specific instructions on what this day should look like and the Warheim Park Board of Directors, along Hal's family, created a day that Hal would have loved. Brigid Kaelin sang Hal's favorite songs, while Rosie Felfle's daughter (Warheim Park Board Member) did an interpretive dance in a rainbow unicorn costume. The mariachi band performed and flamenco dancers danced. About 100 friends, family and neighbors enjoyed German inspired food on this lovely October day. It would have only been lovelier if Hal were present. Who inspires us? Hal Warheim! Hal is featured in the fifth edition of ForGood magazine, a publication of the Community Foundation of Louisville. ForGood is an expression of their commitment to promote the understanding and participation in philanthropy in all of its different shapes and forms. If you aren't familiar with Hal yet or haven't heard the story of why he wanted to build a park in his neighborhood, this article is a great overview. I have heard the story many times, but am still impressed by his tenacity every time I hear the story. You would think it would be easy to build a beautiful, peaceful sanctuary in your neighborhood, but you'd be wrong. There was resistance along the way from the City of Louisville, Metro Parks and some neighbors. This didn't deter Hal, mostly because he had a guiding belief that we should each live a life that benefits others. After 30 years, his dream became a reality when the park opened in October of 2004. Thanks to the Community Foundation of Louisville for the profile. Read it online at https://goo.gl/DyMWta. If you have been in the park lately, you might have noticed the frog is missing. In June, the frog was uprooted. We don’t know who did it or why. We’ll assume the best and hope it was a group of rowdy kids who uprooted it by accident. I’m imagining the shock, then laughter, followed by panic as the group ran out of the park, hoping no one saw them. Regardless of the intent, the Warheim Park Board of Directors takes care of such incidents. I spoke with Jim Clements, a board member since 2014 who sits on the maintenance and beautification committee, about the frog and how his committee plans to fix it. Jim lives at the entrance of the park, which gives him a special perspective. On June 23, Jim heard a group of people in the park long after dark, “a little noisy, but not rowdy.” He walked down the next morning, expecting to find their beer bottles. Although the site was clean, he found the children’s playground frog wrested from its footings, the result of vandalism. He reported it to the board at the next monthly meeting. Jim said, “Typically, one or more of us tries to resolve any vandalism as soon as possible.” He prepped the frog for replanting, but has been waiting for some cooler days to install it. Some of you may assume Metro Parks would take care of this problem. While Louisville Metro Parks Department holds the title to Hal Warheim Park, responsibility for the supervision and maintenance of the park rests solely with the Warheim Park Association and funding comes entirely from donations and fundraising. The park’s maintenance, preservation, and improvements are managed by the Warheim Park Association Board of Directors, an all-volunteer group of individuals comprised of residents, like Jim, in the immediate neighborhood. If you are visiting Warheim Park, and see anything that needs attention, email warheimpark@yahoo.com.